Do you often wonder where you are going wrong in your golf game, frustrated with your set-up or inability to cut strokes while putting, well leave it to a former retired Marine to get it right with SQRD Up, the newest laser alignment tool that is taking the golf market by storm. When we first heard about this amazing teaching tool, that has since been nominated for several tech innovations of the year, we had to get our hands on it and see why people have already have been wondering why this product created by Randy and Michael Bowman had not existed before now. Their creative slogan of “Someone Mowed the Fairways” is a great way of knowing what your body is going to do with a square face to the club. 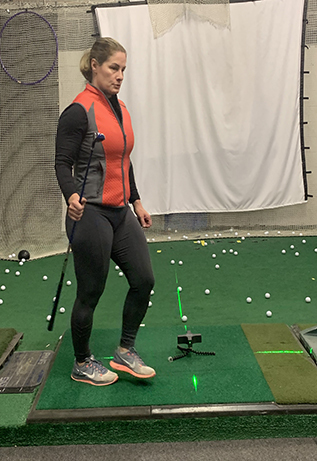 We took this ingenious tool over the past two months and put it to the test and even had our coach PGA Teaching Pro Erika Larkin help us put it to the test and see how it could help us get a better look at our swing. What you will find is the laser is very accurate on the set up and helps you get your feet and club face square well over 90 percent of the time. When we removed the laser for a real shot, the alignment was perfect. The other 2 shots or so out of ten could have been mechanics, but alignment was much better than before. On the putting green, the read is amazing and in the later hours of the day as sun dips, this is an amazing aid to get a solid read and work on lowering a couple strokes off our round. Mostly we used this on the practice green, so logically the stance and set up should be about the same. Either way, the four laser beams are very accurate and help see where you need to strike the ball. For the mid-handicappers, this is a great tool to take off at least 5 to 8 strokes on 18 holes. We think the best asset will be putting with this tool and getting it right from there. The old saying putt for dough will be more of a reality if you give the SQRD Up a try. For more information on how you can improve all parts of your game with this award winning tool, click the link below for information and how to purchase one of these gems.